What I saw the track list for this album, I first thought “Nine songs. That’s not too bad,” then I realized the shortest song is 5 1/2 minutes and the longest songs clocks in at nearly 13! Yikes. Songs that long can sometimes be a chore and a bore to get through but I’ve found myself enjoying most of what these German prog metal-heads are offering up. 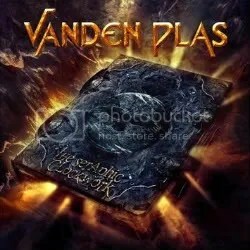 I am not familiar with Vanden Plas. They have been around since the 1986 so it is entirely possible their sound developed and evolved completely on their own but I have to say they have a very similar sound to Dream Theater and in lighter moments — Rush. Even in my unfamiliarity with prog I could easily pick that out. This certainly isn’t a knock on the band. It’s like telling an AOR band they sound like Journey or a thrash metal band they sound like Metallica — it’s high praise, I think, even if that means the music doesn’t sound completely original. The smooth vocals of Andy Kuntz unsurprisingly bring to mind Dream Theater’s James LaBrie. LaBrie isn’t the only singer Kuntz reminds me of though. What may come as a surprise is that I am also reminded of Don Dokken… and that was before I knew they covered Dokken’s “Kiss Of Death” for one of their previous albums! Another surprise is Kuntz sounding like Great White’s Jack Russell. Just listen to “Quicksilver” and tell me it doesn’t sound like Russell when he sings a ballad! When the album rocks, it is very good. “Holes In The Sky” may very well be one of my favorite songs of 2010 and “Frequency” is good metal but I’ve found there are many slow, light moments sprinkled throughout these lengthy song. The keyboards get more of the spotlight than I would have wished as well. Though prog fans will probably get more of a kick out of this album than I did, I still think The Seraphic Clockwork is a solid album with enough hard ‘n’ heavy moments for a thumbs up from me.